The Sawant campaign and Socialist Alternative understand that electing one representative to Seattle’s City Council will not be enough to win the victories that the working class so desperately requires, like a $15/hour minimum wage. Instead, we believe that it is absolutely vital that our campaign support and encourage broader movements of workers, students, and the poor. Due to this understanding, we have taken concrete steps to push the movement for a $15/hour minimum wage forward. Our campaign in 2012 was the first to introduce this demand to Seattle; this has cemented us as one of the leaders in this movement. Kshama Sawant is definitely seen as leading this charge. 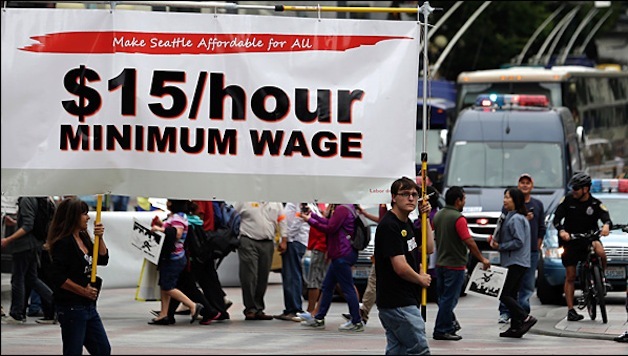 This was further augmented by publishing an article by Sawant in The Stranger, a prominent local alternative weekly newspaper, dispelling some of the common myths around raising the minimum wage (6/4/2013). This article was later picked up by a few national news outlets. In addition to the work for the campaign, Sawant campaign workers and volunteers have been actively participating in the protests and marches organized by Good Jobs Seattle. Sawant’s campaign and Socialist Alternative have also mobilized supporters to go to nearby SeaTac to lend support to workers there who have fought to get an initiative on the ballot this fall that would create a $15/hour minimum wage for workers at the airport. Once again putting our work front and center of the debate! All of the attention this demand has been receiving has forced the corporate Democrats running in Seattle to address the issue. Their comments are revealing though. On one hand, they say they support the workers’ demands. But then they refuse to support the call for $15/hour (Seattle Weekly, 6/4/2013). This clearly demonstrates that their sympathies are little more than election-year rhetoric. Meanwhile, the union leaders who help fund and organize these protests have consistently excluded Sawant from speaking at rallies and have instead featured these same Democrats who refuse to support their demands. This demand is no longer debated on the fringes of society. Instead, it has been propelled into the mainstream political debate in the city, the region, and even nationally as evidenced by an AP article featuring Sawant in August that has been picked up around the nation. We plan to continue the push to keep this demand at the front and center of Seattle politics. There are town hall meetings planned to discuss the demand with communities throughout the city. We also plan to call for a well-organized mass protest that can reach out to large portions of the community. We believe we can win this fight but we need the help of workers, the community, and you!